Conflicts of interest at the USA Expo 2010 Pavilion? Nick Winslow responds, legalistically. 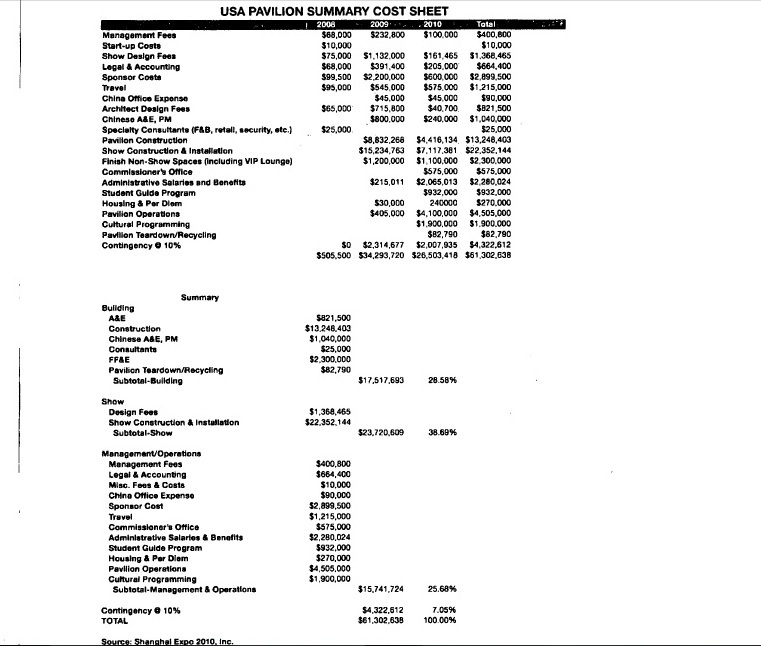 In early May I obtained a budget for the US pavilion contained in a document request from the Internal Revenue Service. It’s an interesting document, available here. I won’t bother going into an analysis of it for the purposes of this post, but it’s no understatement to say that several items in the budget – especially the $23 million budgeted for the three short films in the pavilion – raised eyebrows across the Expo community. It also raised an important question: how did the US pavilion manage to spend $23 million on films, $61 million on the pavilion as a whole, and still manage to end up with a pavilion that – across the board – has been subjected to scathing reviews (see here, here, and here for examples from the mainstream press). Well, one obvious explanation would be that somebody associated with the US pavilion had or has a financial or business relationship with BRC Imagination Arts, the contractor on the films and pavilion program, and that person would benefit in some way from the excessive payments to BRC. And, from the beginning of the tortured, murky process that resulted in the derided USA pavilion, considerable suspicion has been focused on Nick Winslow, the president of the non-profit organization, Shanghai Expo 2010, Inc., that designed, built, and manages the US pavilion. Why the suspicion? A couple of weeks ago I was reading through IRS filings related to the US pavilion when I came across a Winslow resume dating to mid-2009 suggesting that he did, indeed, have a business and financial relationship with BRC Imagination Arts. I blogged on the subject, here. The relevant passages from the resume can be found below, underlined in red (click to enlarge). Now, the resume suggests that Winslow was – as of June 2009 – an adviser and owner’s representative to BRC Imagination, and – if that’s the case – it would place the US pavilion’s tax-deductible 501c3 status at risk (officers with 501c3 organizations are prohibited from having financial or business interests with organization contractors). So, before publishing the resume and my concerns, I contacted Winslow, the US Consulate, the spokesman for the US pavilion, and the CEO of BRC Imagination Arts for comment on whether the document was accurate, and the precise nature of Winslow’s relationship to BRC. I received no response and so, after five days of waiting, I posted. But, to be honest, the matter continued to trouble me. And so, after several more days of silence, I reached out once again, via another channel, to the pavilion. Now let me back up for a moment. Ever since Jose Villarreal was appointed to be Commissioner General to the US pavilion, the organization has – progressively – become more and more transparent. There are still some rather significant secrets associated with it – for example: who at the State Department selected Shanghai Expo 2010, Inc to design, build, and manage the structure? – but Villarreal has made a good effort to lift the curtain and answer questions – especially many of my questions – about the pavilion and its managing organization. So, roughly ten days after posting the Winslow resume, I received a Winslow statement that attempted to answer my questions. Unfortunately, it raised more questions than it answered and so I felt obligated to follow-up. About a week later, I received answers to those follow-ups. In the interest of fairness, I’m going to post Winslow’s statement and answers in full. But first, a quick note (and a few notes along the way). Even a quick scan of Winslow’s answers reveals that they are very precise, very legal. This is interesting on a number of counts. First, I twice interviewed Winslow in 2009, and he is – on the phone, at least – quite freewheeling and informal, willing to say just about anything (this is an impression that others have shared with me, as well). That personality is missing from the answers that he provided to me – especially the follow-ups. Did Winslow enlist legal counsel to help him answer my queries? I asked, but did not receive an answer on this point. As a writer, however, the conclusion seems inescapable. Which leads to the question: what would motivate somebody to enlist a lawyer for help answering questions posed by a blog? The only answer that I can reach is this one: somebody has reason to be concerned about the legal consequences of his/her answers and associated actions. Does Winslow have reason to worry? Well, I’m not a lawyer, but it’s certainly the case that one complaint has been filed with the IRS in regard to his relationship with the USA pavilion, and I’m aware of a second currently in preparation. Whether or not those complaints are investigated is something that isn’t public. Much of this is speculation, of course, and I’m not sure that it’s worth taking it much further than I have. At this point, I think much of this could be settled by a proper and fair accounting of precisely how the US pavilion was awarded to Winslow, who, precisely awarded it and why, how and why so much money was spent on the pavilion, and how could so much money produce such a poor result? Many of these questions could be answered by the IRS; others will need to be answered by the State Department and/or Villarreal in his final report on the pavilion, due after the end of the Expo. In any case, without further ado, Winslow’s explanation of his resume, and his answers to my follow-up questions. For context, once again, below, the passage in question (click to enlarge). “This will clear up any confusion about the appropriate separation of business between me (Nick Winslow), Shanghai 2010 USA Pavilion (the 501c3) and BRC Imagination Arts. Q. Where is the typo that Winslow references? Where, precisely, would the comma go? I don’t understand how a comma would change the resume. Perhaps he could provide a re-write of the section in question? A. The missing comma after BRC Imagination Arts would cause the phrase that follows to be a collection of various attributes applicable to various clients previously named, rather than all specifically to any one. In any case, the facts do not support the accusation; Nick Winslow has never been an agent or representative of BRC Imagination Arts. Furthermore, there is no hint of deception here; the typo did not cover anything up. “• There are very few of us in this business, so just about everyone on the numbers side (i.e. me) has worked with just about everyone on the creative side. For example, I have worked at different times with both BRC and Barry Howard. • Since BRC started work for Shanghai 2010 USA Pavilion and since the formation of the 501c3 (Shanghai 2010 USA Pavilion) no business relationship or payments of any kind have taken place between me and BRC (including all entities owned or controlled by BRC and Bob Rogers) other than as provided by the contract between BRC and the 501c3 for the USA Pavilion. On 3/28/08 BRC made the final payment to me ($600) for consulting on a theme park for Dubai. With this payment, this and all other business relationships between me and BRC were paid up and concluded. After this date no other business relationships between BRC and me have existed other than the contract between BRC and the 501c3 (Shanghai 2010 USA Pavilion). “o The formation of the 501c3 took place on April 2, 2008. Initially this entity had no cash. o BRC began work for me on the USA Pavilion in April of 2008, at BRC’s own risk, on a voluntary basis without a contract and with no guarantee of payment. o BRC and Shanghai 2010 USA Pavilion signed their first agreement regarding this project on May 2, 2008. This agreement covered only the Vision Phase (the beginnings of concept development). • It was not until over a year later, on July 29, 2009 (just 9 months and a couple of days before the opening of expo) that BRC signed the production phase agreement which authorized creation and production of the BRC deliverables that entertain people in the pavilion today. Q. In light of Winslow’s acknowledgment that there’s an error in the resume, and the fact that a complaint has been filed with the IRS partly based upon that error – will Winslow file a corrected resume with the IRS? If so, when? Can I see it? A. Winslow will follow any/all obligations to and/or directions from the IRS with respect to any and all document requests. Q. Given that agreements were reached with BRC BEFORE the 501c3 was formed, I am somewhat dubious of the claim that BRC started work SINCE THE FORMATION of the c3. Would be good to see the contract(s). Can I? This is not correct on several counts. o	No agreements were reached before the 501(c)(3) was formed. The 501(c)(3) was formed 4/2/08. The first agreements between the 501(c)(3) and BRC were reached on 5/2/08. o	No work began until after the formation of the 501(c)(3). [ed note: BRC and Winslow would have you believe that BRC didn’t begin work until the formal documents were signed, that there were no emails or discussions prior to those dates] ] The first work took place April 10 and 11, which was after the formation of the 501(c))(3) but before the signing of the agreement. This initial work was limited and speculative. Speculative work is not at all unusual in this industry – in fact it is a normal part of the sales process to have an exploratory meeting or do some light creative brainstorming on spec, with no signed contract. (Barry Howard/BH&L Group did the same.) In this case BRC attended a meeting April 10 and 11 with a client (Winslow) who said they had no cash, made no guarantee that BRC would be paid and signed no agreement. On those dates Winslow was also not sure he had a project. The March 17 announcement by the State Department that an LOI had been signed was not given to Winslow by the State Department until 4/17/08. The first agreement between BRC and the 501(c)(3) was signed 5/2/08 and the first check was given to BRC that day. o	In any case, all of the above activities came after the close out of all other business between Winslow and BRC. Q. What, precisely, was Winslow’s relationship with BRC? As a ‘consultant’ – as opposed to an owner’s rep or advisor? Is there a difference? If so, what is it? Aside from receiving payment for $600 for work on a theme park in Dubai, Winslow offers no insight into what he DID do. All he describes is what he DIDN’T do. A. A consultant performs specific work, either by the hour or for a lump sum, usually in service of a specific project. As an example of consulting work, a consultant might write a report analyzing the economic feasibility for a proposed project or look over a draft staffing/operational plan and advise ways of improving it. Prior to (but never after) the formation of the 501(c)(3) Winslow performed these kinds of specific consulting services for BRC. o	An Owner’s Rep is like an agent, responsible for obtaining work, and is sometimes paid based on their success at getting work for their client. Nick Winslow has never been an agent or representative of BRC Imagination Arts. Winslow has never been promised, nor has he ever received, payment of any kind from BRC based on Winslow seeking or obtaining work for BRC. 5. Winslow writes: “BRC began work for me on the USA Pavilion in April of 2008, at BRC’s own risk, on a voluntary basis without a contract and with no guarantee of payment. ” But there must’ve been some agreement, no? Verbal? o	This is not unusual in this or other fields. BRC performed a very small amount of creative work at its own risk. The 501(c)(3) said that they did not have the cash to pay BRC, nor did they sign any contract. There was a high probability that nothing would come to BRC or the 501(c)(3) in exchange for this work. o	Barry Howard’s team faced exactly the same speculative situation with their work. Like BH&L Group, BRC hoped that the free ideas would win approval and that a contract would follow. But at the time the initial work was performed (April 2008) there were no guarantees to anyone. o	This is normal in our business. o	The vast majority of BRC’s work was not confirmed until over a year later when the Production Agreement was signed on July 24, 2009, only 9 months and a couple days before the opening of expo. 6. I think much could be illuminated by providing a look at the books. Is that yet possible? •	Deloitte is the accounting and tax services provider for the 501(c)(3) and has participated in the preparation of the company’s budgets and financial statements. The Board of Directors of the 501(c)(3) has reviewed and approved all budgets and financial statements of the company. The company will file tax returns at the appropriate times and provide an audited set of financial statements. Audits will be conducted by a major US accounting firm. Six of the seven members of the 501(c)(3) board are outside directors. Well. This stands as one of the lengthiest Shanghai Scrap posts, ever. If you made it to the end, congratulations – you are a true US pavilion wonk. I’m going to open up comments with the hope that they’ll be substantive and intelligent. And fair warning: comments from State Department IP addresses will be outed immediately unless they are accompanied by a real, verifiable name and email address. This entry was posted in Expo 2010, Expo 2010 - US Pavilion by Adam. Bookmark the permalink. The language in Winslow’s response to your followup is all the proof anybody needs to know that lawyers are now involved. The responses were probably written by Ellen Eliasoph and not an outside hire. If Nick is in trouble she has considerable exposure and so does her firm. Not complicated to see how this is going to play out. Winslow says that there was a comma missing. In the follow-up he or his lawyer says it’s all accurate. This isn’t raising red flags all over the US pavilion? Anybody checking into other parts of his story that changed recently? The funnisest part of this whole thing is all of those super educated state department people figuring out that they sold out their pavilion to a third rate hollywood huckster. Nobody could ever pull this crap in LA. He’d be run out of town. Are these the same state department people we depend upon for trade negotiations? Dialog with North Korea? Helping Americans in distress? Screwed if so. I have no knowledge of course of any dealings between Nick Winslow and BRC,but if contributing voluntarily to Winslow’s effort to secure the elusive Letter of Intent from the State Department necessary to initiate fund-raising for the Pavilion, was his sole motivation for inviting BRC to join his and Ellen’s team, why would he not have asked the BH&L group to assume that role. BH&L group had already delivered a comprehensive vision for the Pavilion to the State Department over many months of effort and at considerable unreimbursed expense as a participant in the RFP competition that preceded the selection of Winslow & Eliasoph as recipients of the LOI. even though they had never competed in the RFP process. Nick Winslow was fully aware of the BH&L submittals under the rules of the RFP, because as a long time friend and colleague I personally shared the information with him on two separate occasions, seeking his counsel and support in bringing our candidacy for the Pavilion to a successful conclusion. Imagine my shock when I learned that he not only made inquiries on our behalf of Ellen, with who he had worked at Warner Bros and whose husband worked for the Government (his description, not mine) but somewhere in that dialogue decided to align himself with those individuals and seek to acquire the project for himself. Even then, why not simply recruit our team as creative consultants, given that we were by far the most Expo experienced team in the mix and had already formulated a coherent approach to the Pavilion content and storyline, all of which is on the public record. Certainly puzzling at best. Who designed the POS building and what HE get paid? I largely agree with your conclusions, but I would also enlist legal help to answer challenging questions from a journalist blogger. Blog content is available forever. I attempt to be thoughtful in all written professional communication, but I would be exceptionally thoughtful, perhaps even use a lawyer, in a public statement to a journalist who is investigating me. Perhaps this is only because I am in law school? These quotes are infuriating. I agree with your aim, but I can’t help but think you want it both ways: you call yourself a lowly blogger when it suits your needs, but you hold others to the standards of top newspapers. So many of these posts are little more than work in progress. I’m glad somebody is following the Expo mess closely, but I’m concerned that someone who doesn’t deserve it will have their career trashed. Adam, great coverage of a complex scheme to realize personal gain (and political favors) waving the flag of the American people. I don’t mind your speculations: they’re all we have due to Winslow’s organization failing to file tax returns for 2008 and 2009. If we failed to file, the IRS would be all over us with fees and penalties. Apparently when faux-tax exempts break the law, they get special treatment. I say “faux” because although Winslow consistently uses the term “501c3” to characterize his and Eliasoph’s company, Shanghai Expo 2010, Inc., the US Pavilion’s organizers, in fact SE 2010 was not a 501c3 in 2008 and only received its tax exemption on July 24, 2009. While it’s true that the IRS often backdates tax exempt status, in fact at the time SE 2010 received its IRS approval, its certificate of incorporation as a nonprofit had been revoked by the District of Columbia, again for failing to file necessary documents. It only was reinstated by DC in January 2010, fully six months after the IRS acted and eight months after Hillary started her fundraising blitz. In other words, the IRS erred and Hillary erred, each bestowing “501c3” — tax exempt — status on SE 2010, Inc., when in fact it was not eligible for such treatment. I’ve filed a complaint to that effect with the IRS; whether it will act on it, who can say? If it has integrity and a respect for the law, it will. Note that July 24, 2009, the date on which SE 2010 allegedly contracted for its tiny but expensive movies, is the exact same day on which its IRS “determination letter” issued. That is, the contract was signed precisely when SE 2010 expected to be covered for sure by the IRS determination. Again, the only problem is that the determination was fatally flawed in that the IRS found “tax exempt” a corporation that the founding state held “in bad standing,” its certificate revoked. Winslow’s account raises more questions than it answers. It contains links to the actual complaint I filed with the IRS (available for download online) and a related “Request for Investigation” made to the State Dept. Office of the Inspector General in November 2009, now stalled somewhere in the State Dept. (also available for downloading). There’s also a link that tracks back to several other articles I’ve written on the Huffington Post regarding the US Pavilion. The US Pavilion story is pathetic, but the pavilion’s real significance is as a symptom of a prevailing State Dept. policy to privatize American public diplomacy. One thing is for sure, everyone working in US Pavilion is pretty nervous. Management is applying pressure on workers regarding info, especially financial data. Watch for more scandals to come.